More about Churchward’s works later. There is even a group called “The Lemurian Fellowship” located in Ramona, California, which has published its concept of a map of the lost continent (see Fig. 1). Fig. 1 - Continent of Mu (According to the Lemurian Fellowship). The map of Figure 1 is, presumably, psychically derived. Interestingly, it shows that portions of far northeastern Lemuria were located in western America. This rendering seems to echo the following Cayce reading. Before that we find the entity was in that land now known as the American, during those periods when there were the changes that had brought about the sinking of Mu or Lemuria, or those peoples in the periods who had changed to what is now a portion of the Rocky Mountain area; Arizona, New Mexico, portions of Nevada and Utah. The entity then was among the princesses of the land that established there the teachings of the Law of ONE, from the activities in the land which had brought destructive forces through the separations from those things that made for the love of the individual for the gratifying of selfish motives. Then the entity established what may be called the home life in that land, as each home became then as the castle of place of worship - or activities that were separated, yet united in one as for purposes. The name then was Ouowu. Next we have the story of Phylos, a disincarnate master who was channeled by F.S. Oliver in 1883. 5 Whatever one may think of Edgar Cayce’s psychic readings, Phylos was implied to be a credible source in one of them (#364-1). In his book, Phylos speaks of a previous life on Lemuria. He describes "queer little horses, having three toes to each foot and high shoulders," a "great house built of stone," and a swarthy, brown-skinned man, "his hands talon-like." Such information indicates a late Miocene time at the earliest -- up to nine million years ago -- and an earlier race of man. The Cayce readings refer to a lost continent in the Pacific by several names, but most often it is called Lemuria. Other names are Mu, Zu, Lu, and possibly Oz. Some of these may refer to provinces of the continent, or to portions left after a major break-up of the land. Here are three representative readings. Before this we find the entity in that land now known as the American, during the periods when the Lemurian or the lands of Mu and Zu were being in their turmoils for destruction. And the entity was among those that -- in what is now not far from that land in which the entity in this sojourn first saw the light [the woman requesting the reading was born in the Santa Rosa/Petaluma, California area -- (that must in the near future fade again into those joinings with the land of Mu) -- established a temple of worship for those that escaped from the turmoils of the shifting of the Earth at that particular period. Before that we find that the entity was in that land known as Mu, or the vanished land of the Pacific, the Peaceful; during those periods when many of those had risen to power when there were being those banishments and preparations for the preserving; for they had known that the land must soon be broken up. Here we have reference to a time when souls could act directly upon materiality. This aspect of the readings’ references to Lemuria finds resonance in the book, Atlantis to the Latter Days 7. The work is said to have been inspirationally dictated to Mr. Randall-Stevens by two disincarnate masters. "was accomplished as the outcome of a series of volcanic disturbances which gradually undermined the substrata comprising the foundations of that continent." “Black magic was rife and the chances of those who still remained steadfast to the cause of divine evolution were almost hopeless.....During previous periods all those who were to be collected in Atlantis had been ordered to proceed to that continent." Randall-Stevens writes that the final destruction of Lemuria occurred about 30,000 years ago. Submergence of Lemuria must have had worldwide geophysical consequences. The date of 30,000 B.P. coincides with the second period of disturbance on Atlantis when "there were [produced] small channels through many of the lands" (470-22). But reading 364-4 seems to imply that the final demise of Lemuria occurred perhaps only 10,700 years before the final destruction of Atlantis, or 22,600 years ago. ….the variations [in the spiritual, material, and commercial aspects of Atlantis] as we find, extend over a period of some two hundred thousand years - that is, as light years - as known in the present - and that there were MANY changes in the surface of what is now called the Earth. In the first, or greater portion, we find that NOW known as the southern portions of South America and the Antarctic or North Antarctic regions, while those in what is NOW as Siberia - or that as of Hudson Bay - was rather in that region of the tropics, of that position now occupied by near what would be as the same LINE would run, of the southern Pacific, or central Pacific regions - and about the same way. Then we find, with this change that came first in that portion, when the first of those peoples used that as prepared FOR the changes in the Earth, we stood near the same position as the Earth occupies in the present - as to Capricorn, or the equator, or the poles. Then, with that portion, THEN the south Pacific, or Lemuria, began its disappearance - even before Atlantis, for the changes were brought about in the latter portion of that period, or what would be termed ten thousand seven hundred (10,700) light years, or Earth years, or present setting of those, as set by Amilius - or Adam. Can science shed any light on the possible reality of Lemuria? Do we have any evidence that the floor of the Pacific could once have been elevated over a continental-sized area? We have heard of hotspots that invoke narrow, isolated upwellings from deep within the Earth, like the hotspot produced by a thermal plume that some geologists think was responsible for the Hawaiian-island chain. Such a hotspot is surrounded by shallow seafloor less than about 1000 km in cross-sectional diameter, called a "swell." A "superswell" is also believed to reflect mantle upwelling. But it expresses itself as an extensive, anomalously shallow area of the seafloor. And its scale is several thousand kilometers across. This is as large, for example, as the island continent of Australia. McNutt’s review of several lines of geophysical evidence allows her to conclude that one of the best examples of mantle-convective origin of an Earth feature is the South Pacific Superswell (SPS). (See Figure 1 for a partial outline of the SPS). shown in yellow are after McNutt (1998, Fig 17) and Staudigel et al. (1991, Fig. 1). This is "a broad area of uplifted seafloor containing numerous volcanoes in French Polynesia." The boundaries of this superswell contain the Society, Cook, Austral, Tuamotu, Marquises, and Easter island chains. These islands reflect an enhanced rate of volcanism in the superswell area due to enormous quantities of hot mantle rock below the ocean floor. If the South Pacific Superswell were once above sea level, forming the continent of Lemuria, it would have been buoyed up by a broad bulge in the mantle, much like that recently inferred to be buoying up the lofty peaks and plateaus of the American West. A renewal of mantle upwelling beneath the SPS could result in the seafloor there rising above the waves once again. "In the next few years, lands will appear in the Atlantic as well as in the Pacific." “volcanism can be attributed to [crust and mantle] downflow and recycling at the recognized subduction zones of Indonesia and the Pacific rim, but to upwelling and decompression melting at mid-ocean ridges and ‘hotspots’. Some of the Pacific island chains, best exemplified by the Hawaiian chain, are conventionally attributed to reheating of a lithospheric plate as it migrates over a deep-source hotspot. Keith then goes on to reveal that the combined geophysical and geochemical evidence brings out the inadequacy of the plume model, thus leaving open the problem of accounting for linear oceanic island chains. 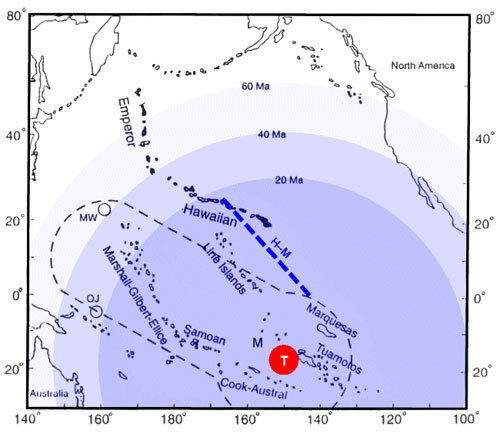 Pacific Island chains and related features, as modified from Figure 22 of Keith, 2001.
and deduced to represent a Mesozoic impact-triggered disturbance of the steady-state mantle convective system. Manihiki (M, 115-125 Ma), Marcus-Wake Seamounts (MW, 90-115 Ma), and Ontong-Java (OJ, 100-125 Ma). The peak of the persistent residual plume corresponds to the broad South Pacific Superswell and South Pacific Isotopic and Thermal Anomaly centered roughly at Tahiti (T). Keith proposes that the final stage of mantle/crust downflow is currently focused on an elongated mid-Pacific zone (trend-line H-M) that extends from Hawaii to the Marquesas. Keith identifies this as the residual trace of a cold, depleted mass that developed below the ancestral Mid-Pacific Ridge. The South Pacific Isotopic and Thermal Anomaly (SOPITA) mentioned in the captions for Figures 2 and 3 is defined not only by relatively hotter mantle temperatures but by differing spatial domains of concentrations of isotopes of lead, uranium, strontium, and neodymium. These differing domains suggest that the Superswell may be located over a stable, persisting zone of upwelling from the lower mantle. Such upwelling may have been acting as a barrier since at least the Cretaceous, separating two large mantle domains with differing convective histories. The SOPITA data are believed to require interactions between the deeper and shallower layers of the mantle. There is much more to Prof. Keith’s hypothesis for explaining various features of the Pacific basin, but I know that you are already bored to tears, reading so much unfamiliar terminology. Suffice it to say that Keith makes the case for oceanic island sinking within a surrounding zone of normal to low heat flow and high seismic wave velocities that indicate mantle downflow beneath the islands. What does this mean for the hypothesis of the existence of Lemuria, or Mu? On a much larger scale - the scale of the SPS or even larger - we can postulate that in the Cretaceous there was a continental-sized land mass above sea-level in the Pacific basin. This was produced by an impact event. The impact was sufficiently great to produce an enormous plume of lower-mantle material that pushed up roughly beneath Tahiti. Then, starting in post-Cretaceous time (about 60 Ma), as the crust and outlying mantle cooled and contracted, the continent gradually sank over the ensuing eons. This sequence of events is similar to that which we reviewed in our previous article on the Atlantic Basin. It’s just that the North Atlantic geologic structure is the prime example of a least-disturbed, steady-state mantle flow regime. The Pacific, however, can be regarded as an extreme example of a disrupted mantle-flow regime. Is there any archaeological evidence of Lemuria? Maybe. Richard Noone has written 10 about the presence of ancient construction works on two Pacific islands, Malden in the Line Islands, and Rarotonga in the Cook Islands chain. The two islands lie close to (Malden) or just within McNutt’s boundary for the South Pacific Superswell. (See Figure 2). Malden Island (4.00ºS, 155.00ºW) seems to contains the remains of a highway system that radiates outward from a temple complex. Composed of tight-fitting basalt blocks, the roads cross beaches and disappear under the waves. "Fifteen hundred miles south of Malden Island, another section of the same type of road emerges from under the waves, crosses the beach, and disappears into the jungle of Rarotonga Island. This suggests that many Pacific Islands are the remains of a presently submerged Pacific continent"
I am pleased to have Joan Griffith, a long-term member of A.R.E., drop by (electronically) to discuss her research of 64 years running on the history of Mu, as found in the works of Churchward and others. WH: Joan, just when did you come into contact with Churchward’s works? JG: Col. Churchward (1851-1936) was a lifelong friend of my father’s, from about 1880, when Dad was a boy. The Col. met explorer Augustus Le Plongeon at my grandmother’s Brooklyn townhouse; they compared notes on similarities of ancient inscriptions, ruins, and sacred texts both of Maya and Sanskrit or Pali in Yucatan and Tibet respectively, as my Father listened intently. I met the Col. only once as a young child, just before his death in 1936. He seemed to know that I would be interested in expanding upon his work in the future. I started reading the Mu books that year; so you see much of my life has focused on Atlantis, Lemuria, and ancient knowledge that might have been lost thru the millennia. In 60-plus years, much has been discovered that has supported many of his claims. What isn’t generally known is that he accessed hundreds of sources and listed over 140 ruins and megalithic sites. This was not psychically-derived information, though most of it tallied with what Edgar Cayce later had to say on Mu/Lemuria. WH: So you don’t think the jury is still out on whether Mu existed? JG: The sheer mass of detailed evidence that Churchward compiled (five books just jammed full) presents an overwhelming case for it. Since then, in the 1930’s, soundings of the Pacific by Capt. Claude Banks Mayo of the U.S. Navy show that there is "a submerged continent, with mountains, river courses and plateaus at an average depth of one mile stretching from the Hawaiian to the Barin Islands, east of the coast of Japan." WH: Do the Cayce readings mention anything about Churchward’s research on Mu? JG: No. It seems that no one asked Cayce about his work. WH: You’ve read what I’ve written above. Would you like to add anything to it? "The southern part of the east Pacific Rise is 2000 km wide and 2 km high, one of the largest oceanic rises in the world.... observations do not rule out the possibility that broad rises may be temporary features which are elevated and then subside." And then there was the exciting discovery of a vast layer of "clean white ash" on the Pacific floor a few hundred miles from Central and South America, extending 750 miles to the west and 825 miles to the south of the equator (N.Y. Times of 4/12/59). E. Anders and D.N. Limber ("Origin of the Worzel Deepsea Ash" in Nature, Vol. 184) believe the ash to be of terrestrial, volcanic origin, and that it must have "recorded a notable event in the Earth’s history." This ash layer may have been related in some way to Lemuria’s sinking. WH: In my modest browsing of Churchward’s books I was perplexed by his hypothesis of gas-belts crisscrossing the world. Do you really think that explosions of underground gas-filled chambers could have had anything to do with the sinking of Mu? Where did he get his information? JG: Churchward advanced a theory of gas-belts crisscrossing the earth, and chambers between layers of granite rock within the lithosphere. The formation and collapse of these chambers, he averred, were responsible for the raising of certain mountain ranges, volcanic eruptions, and sinking of land masses. Churchward cites sources such as the Troano Manuscript, and old Egyptian writings that describe this process. The logic of it appeals to me, although I am not an expert in geology. It seems that science has caught up 80% to his thesis. No matter how it was destroyed, Lemuria won’t be swept under the rug..... and the little chunks of evidence keep popping up... Stanford University’s geophysicist Amos Nur, stated in 1977 that a "Pacifica" was a distinct probability, as crust centers originate under continental masses, except in the Pacific, and that "currently submerged plateaus in the ocean near Australia, including the Minihiki plateau and the Ong-Java area, are remnants of this past land mass." Other explorers have found guyots (sea-mounts), one 11,000 ft. high, under the Pacific waters.... since guyots can only be formed by wave action, this is proof-positive such land sank, and sank far. And coral rings were discovered in the South Seas 1800 ft. deep. So what does that mean? Coral cannot live in water greater than 150 ft deep, I’m told. JG: Well, in French Polynesia.... marking the boundaries of the Superswell (see Figure 2)..... are some of the most thrilling megalithic ruins, in and out of the water... gigantic stone walls, roads, platforms, pillars, 10 to 30-ton blocks (illustrations & descriptions in John MacMillan Brown’s "Riddle of the Pacific" and books on Lemuria & Pacific by David Hatcher Childress). Who built these? In Rap Iti (French Poly) there are coal deposits! Seems indicative of a once "high and dry" Pacific Basin! Doesn’t it? Cosmic Forces of Mu, in two parts (1934-1935); and Books of the Golden Age, 1997. Phylos the Tibetan, 1952, A Dweller On Two Planets, Borden Pub. Co., Los Angeles. "In 1938 while discussing the experiences of the people of the Mayan region who occupied Central America, Cayce mentioned in passing: ’...and there were the beginnings of the unfoldments of the understanding [from] those that were visiting from other worlds or planets.’ (1616-1). "It should be noted that although Edgar Cayce spoke of UFO’s and extraterrestrials, until the day he died he never once in a reading or as a conscious individual wavered with respect to the Christian teaching that Jesus Christ was the Messiah and is ’The Way’ for all of humanity." Randall-Stevens, H., 1966, Camelot Press, London). Reviews of Geophysics: v. 36, no. 2, pp. 211-244. . [Dr. McNutt, a noted geophysicist, is currently (4/01/02) president of the American Geophysical Union (AGU), a scientific society with 15,000-members worldwide]. Keith, M., 2001, “Evidence For A Plate Tectonics Debate,” Earth-Science Reviews, 55. 5/5/2000, Ice The Ultimate Disaster,1982, Three Rivers Press, New York. “James Churchward and His Lost Pacific Continent,” 2002, World Explorer, v. 3, no.1, pp. 16-25.